Legendary actor, Sir Christopher Lee, sadly passed away on Sunday at the Chelsea and Westminster Hospital in London, following a short illness. He was 93. 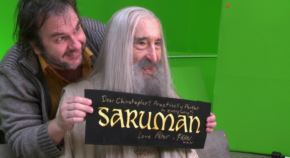 Tolkien fans are familiar with Sir Christopher Lee for his role in The Lord of the Ring trilogy as Saruman, which he more recently reprised for The Hobbit trilogy. He originally auditioned for the role of Gandalf, after sending Peter Jackson a photo of himself dressed as a wizard. Saruman is number one. Saruman is, very definitely, the most brilliant, the most powerful, with the greatest intellect and the greatest knowledge. Gandalf…well he’s number two. But Saruman’s whole character becomes perverted and distorted and he lusts for power and gradually, as it very often does, the old famous quote ‘power corrupts and absolute power corrupts absolutely’. Sir Christopher had the pleasure of meeting J.R.R. Tolkien in the Eagle and Child pub in Oxford, “We were sitting there talking and drinking beer, and someone said, ‘Oh, look who walked in.‘ It was Professor Tolkien, and I nearly fell off my chair.“. Flummoxed, Sir Christopher said “How do you do?” A musician, Sir Christopher released several heavy metal albums, and collaborated with the Tolkien Ensemble on their albums At Dawn in Rivendell and Leaving Rivendell. Aside from his roles in The Lord of the Rings and The Hobbit trilogies, Sir Christopher is well-known for playing Count Drakula in the Hammer Horror films, Scaramanga in the James Bond film The Man with the Golden Gun, and Count Dooku in the Star Wars prequel trilogy. He has starred in over 200 films, making him one of the most prolific actors in history. I still think The Lord of the Rings is the greatest literary achievement in my lifetime. Like so many other people, I couldn’t wait for the second, and then the third book. Nothing like it had ever been written. Other authors like T. H. White and Lewis Carroll invented imaginary worlds, but Tolkien not only invented an imaginary world, he invented imaginary races, which you can easily believe in. And he created very long appendices with all the family trees and the names of the previous Kings and so-forth. It’s quite incredible, really, the scholarship and imagination that went into the writing of it. And what is even more remarkable is that Tolkien, who was a professor of philology, invented new languages. The Elf languages are two: Quenya and Sindarin. Quenya is based on Finnish, and Sindarin is basically Welsh. Most of the Elves speak Sindarin. And if you want, you can learn to read it, to write it and to speak it, just like English or any other language. I always thought the books would make a wonderful film, but I also felt it would probably never happen, because of the enormous amount it would cost to make. But if they ever were made, I dreamed that I would be in them. It just goes to show you, that sometimes dreams do come true.